Just one look at this cheerful design by Lexi Westergard is enough to instantly uplift any mood, making it the perfect inspiration for summer decorating. Are you smiling right now? It's probably because this look makes use of happy colors and patterns, which are strategically placed throughout the room to heighten its abundance of light. A leather couch is topped with a trio of variegated pillows that keep its caramel shade looking more modern than traditional. Meanwhile, a striped table lamp nods to the hues in the nearby pillows, while complementing the intricate cobalt kilim rug underfoot. And though smatterings of blue can be seen throughout this seating arrangement, it isn't the only pigment that makes multiple appearances: gold is everywhere from the light fixtures to the tables, and green is spotted on those gorgeous emerald chairs and in potted plants. Yes, it's quite a kaleidoscope. But since the shades are carefully interspersed on a white backdrop, it works. See for yourself by weaving blues, greens, and gold into your own warm weather hideaway — just make sure that there's plenty of sunshine. 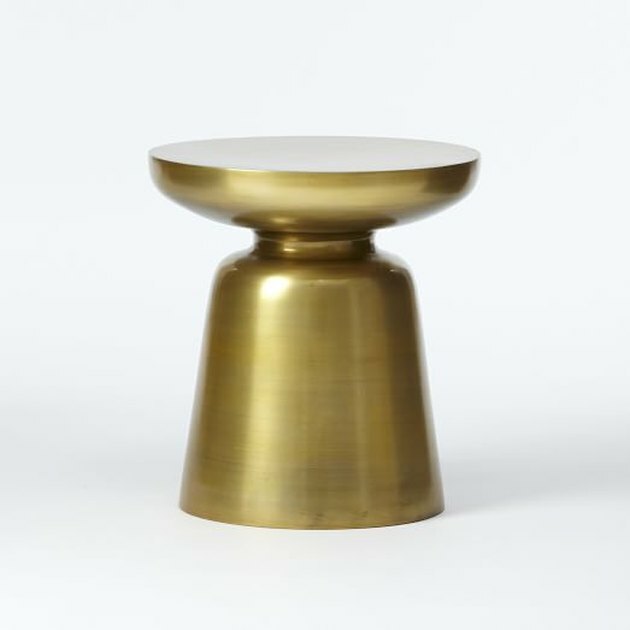 Add a touch of gilded glam to your living room with this side table.